In the clinic today, and Emily isn't quite herself today. Her temp was 99.9 (ack) and she just seems exhausted! She was sent home from school yesterday morning after only being there for about 20 minutes because she said her eye hurt and the clinic was worried she had pink eye. Thankfully her eye didn't bother her all day, so she must have gotten something inher eye but she has picked up something along the way Her WBC is pretty high too which suggests she is trying to fight something. Still waiting for the doctor to see if she may possibly need an antibiotic after her IV avastin finishes. Today is day 15, so her avastin just started about 10 minutes ago. 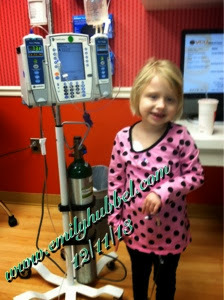 Thankfully her platelets at at 35, so while they are still low, she doesn't require a transfusion. She is sleeping now from the Benadryl. Did hear from Dr Sholler about the trial in Texas, so next week we will provide a tube of blood to send to Texas, but we have to go over the consent with Dr Crystal Louis over the phone first. We just want to have this ready in case we decide on that being the next move. 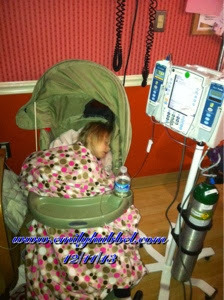 Dr Sholler said Emilys ANC has to be Over 1000 if possible ands that it will take a few months for Chrystals tam to grow and bind to antibody. QWe are also thinking about NYC possibly 3F8, but we are still trying to make the best sound decision. The other thought would be a higher dose of chemo where she would lose her hair, but we just haven't made the best sound decision yet. At this point we just want to make it through the holidays so she can at least hope to feel her best and then decide what is the absolutely best. This round 11 has been hard on her with eating, she hasn't been eating as much and she is still very picky about what to eat and the foods she likes changes often, but hopefully that will pick back up. Thank you to everyone on the Text to Donate day, hopefully it was very successful. 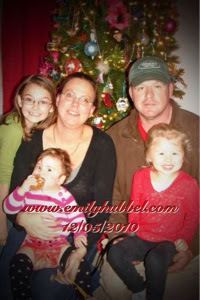 Also the gofundme is still open for anyone that wants to help and I promise it means very much to us, www.gofundme.com/emilysjourney... You can also still make a donation on Emilys webpage or send gas/grocery gift cards to help. We continue to think everyone as we continue on with this journey.